Jimi Hendrix was born Johnny Allen Hendrix (later changed by his father to James Marshall) on November 27, 1942, in Seattle, Washington. He had a difficult childhood, sometimes living in the care of relatives or acquaintances. In many ways, music became a sanctuary for Hendrix. He was a fan of blues and rock and roll, and with his father's encouragement taught himself to play guitar. When Hendrix was 16, his father bought him his first acoustic guitar, and the next year his first electric guitar—a right-handed Supro Ozark that the natural lefty had to flip upside down to play. Shortly thereafter, he began performing with his band, the Rocking Kings. In 1959, he dropped out of high school and worked odd jobs while continuing to follow his musical aspirations. In 1961, Hendrix followed in his father's footsteps by enlisting in the United States Army. While training as a paratrooper, Hendrix still found time for music, forming a band named the King Kasuals. Hendrix served in the army until 1962, when he was honorably discharged after injuring himself during a parachute jump. 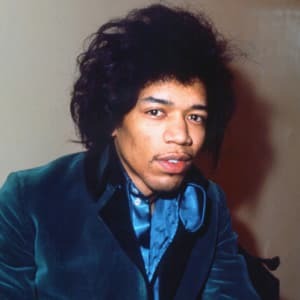 After leaving the military, Hendrix began working under the name Jimmy James as a session musician, playing backup for such performers as Little Richard, B.B. King, Sam Cooke and the Isley Brothers. In 1965 he also formed a group of his own called Jimmy James and the Blue Flames, which played gigs around New York City's Greenwich Village neighborhood. In mid-1966, Hendrix met Chas Chandler—bass player of British rock group the Animals—who signed an agreement with Hendrix to become his manager. Chandler convinced Hendrix to go to London, where he joined forces with bassist Noel Redding and drummer Mitch Mitchell to form the Jimi Hendrix Experience. While performing in England, Hendrix built up quite a following among the country's rock royalty, with the Beatles, the Rolling Stones, the Who and Eric Clapton all becoming great admirers of his work. One critic for the British music magazine Melody Maker said that he "had great stage presence" and looked at times as if he were playing "with no hands at all." Released in 1967, the Jimi Hendrix Experience's first single, "Hey Joe," was an instant smash in Britain and was soon followed by hits such as "Purple Haze" and "The Wind Cries Mary." On tour to support his first album, Are You Experienced? (1967), Hendrix delighted audiences with his outrageous guitar playing skills and his innovative, experimental sound. In June 1967 he also won over American music fans with his stunning performance at the Monterey Pop Festival, which ended with Hendrix lighting his guitar on fire. Quickly becoming a rock superstar, later that year Hendrix scored again with his second album, Axis: Bold as Love (1967). His final album as part of the Jimi Hendrix Experience, Electric Ladyland(1968), featured the hit "All Along the Watchtower," which was written by Bob Dylan. The band continued to tour until it split up in 1969. 1969, Hendrix performed at another legendary musical event: the Woodstock Festival. Hendrix, the last performer to appear in the three-day-plus festival, opened his set with a rock rendition of "The Star-Spangled Banner" that amazed the crowds and demonstrated his considerable talents as a musician. Also an accomplished songwriter and producer by this time, Hendrix had his own recording studio, Electric Lady, in which he worked with different performers to try out new songs and sounds. In late 1969, Hendrix put together a new group, forming Band of Gypsys with his army buddy Billy Cox and drummer Buddy Miles. The band never really took off, however, and Hendrix began working on a new album tentatively named First Rays of the New Rising Sun, with Cox and Mitch Mitchell. Sadly, Hendrix would not live to complete the project. Jimi Hendrix died in London from drug-related complications on September, 1970, at the age of 27. He left an indelible mark on the world of rock music and remains popular to this day.